The horrible death of Canadian Alois Dvorzac in UK immigration detention was big news. What if he'd been from Eritrea or Zaire? "He was on his way to see his estranged daughter. Instead, he disappeared in the maws of the British detention system." 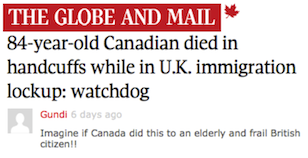 So Canada's Globe and Mail last week summarised the horrible ordeal of Alois Dvorzac, the 84-year-old Canadian who died, handcuffed in hospital, after being seized by Gatwick Airport immigration officials and locked up at Harmondsworth immigration removal centre, near Heathrow. Undignified deaths are routine and rarely mentioned in the media. Hardwick's report provoked a 500 word story in the Daily Telegraph (“A frail 84-year-old Canadian man died in handcuffs . . .”). The BBC’s flagship Radio 4 Today programme gave five minutes: “This frail elderly Canadian gentleman with dementia died in the most undignified and disgraceful circumstances possible really," said Hardwick on last Friday's show. The Home Office claimed Jimmy Mubenga had been "taken ill" on the plane. G4S said he "became unwell". Two days after he died the Guardian revealed the truth in a story supported by eyewitness evidence. Guardian on-line carried an audio recording of one witness: “he was saying I can’t breathe, I can’t breathe”. The BBC didn't report Mubenga's death until five days after the Guardian's report. I asked a BBC home affairs reporter why? He said: Busy week; it was perceived as the Guardian's story. What made Dvorzac’s ordeal so much more compelling? HM Prisons Inspectorate made it easy and safe. They gave the ugly details to journalists two days early in a press release. Plain-speaking Hardwick was put up for interview. There was Dvorzac’s age and fragility. The Today Programme's Mishal Husain asked Hardwick: “I'm trying to work out what kind of culture was in place where someone looks at an elderly man with dementia and cuffs him and when he is dying, doesn't uncuff him?" Then there was the Canadian factor. At the Institute of Race Relations, near London's King's Cross, Harmit Athwal tries to keep count of the detainees and asylum seekers who have died in UK government care or shortly after release — 25 or more since 1989. They'd come originally from Pakistan, Turkey, DRC, India, Iran, Angola, Vietnam, Zaire. Ghana, Moldova, Zimbabwe, Cameroon. Kenya, Eritrea. One more name: Brian Dalrymple. An Inquest into how Dalrymple died is due later this year. GEO Group, Serco, and the Home Office have got some explaining to do. This case is likely to catch the media's attention. Brian Dalrymple is the one white American on Athwal's list. Author's note: Thanks to Simon Parker.